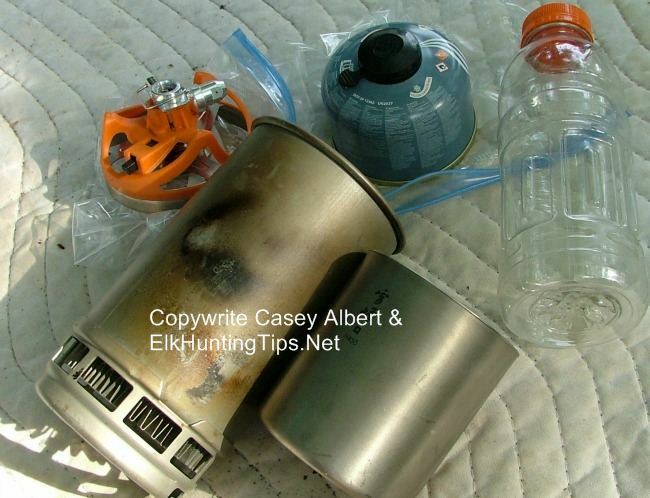 As I was wrapping up my hunt of 2012, I took time to take pictures of some of my gear and wrote notes about what I wanted to remove or replace for my BackCountry Bull hunt of 2013. Weighing individual items has been extremely beneficial in that it forced me to carefully evaluate every item. I don't sacrifice quality to save weight, but I look at every item much more carefully than in the past. 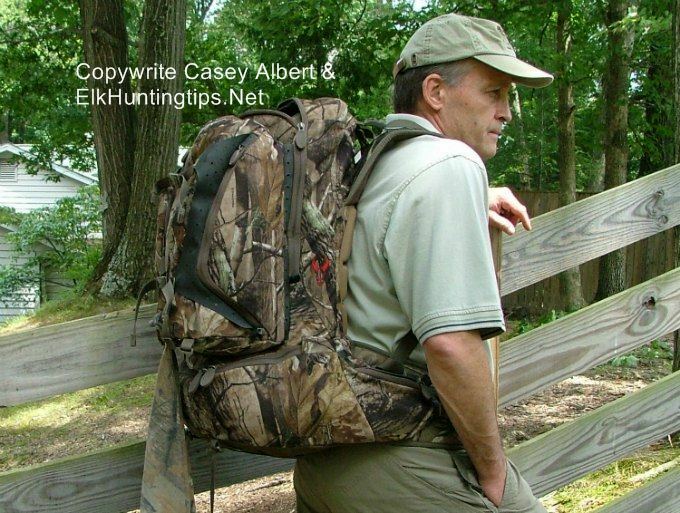 I start planning backpack hunting gear for next year's elk hunt while I unpack and store it after each year's hunt. As I empty my backpack, I take notes of where everything was, whether or not I needed it, or if I needed to find a better alternative. In previous years I simply packed up my stuff and went home planning to make a “pocket specific” backpack hunting list later. “Later” became “next year” and it would usually take the entire hunt to truly have my pack figured out. The last few years I've taken notes as I've packed. It reduces the learning curve dramatically. I am removing, replacing or upgrading several items in my backpack hunting gear for 2013. As I begin preparations for my 2013 hunt, I am referring back to my 2012 list, re-evaluating every item I plan to carry. If the item was not used last year, was it essential? I didn't use my rain pants last year, however they are essential, and have an ever permanent place in my pack. I am constantly thinking about clothing. Proper layering is essential for maximizing comfort and warmth. However, if you are not careful, you might be carrying more than you actually intend to wear. If that is the case, then you are carrying too much. As an example, when it gets cooler, I would sometimes like to sleep in long johns. However, since I'm already wearing pants, and carrying rain gear, I'll sleep in my hunting pants or rain pants if necessary. During archery season, I have never had to wear rain pants over regular pants, over long johns. If I'm not warm enough to sleep through the night, I'm probably not hunting elk where I have been backpack hunting for the past 20 years. I am finding that since I started counting ounces, it has made me “hyper-aware” (my wife's word) of my backpack hunting gear weight. It is easy to see if an item has outlived it's purposefulness, or it's simply time to upgrade. I know we all spend a fair amount of money to go on these hunts, and we are very passionate about it. Having the right gear for this endeavor is paramount. This year I have decided to remove some items such as; waterproof socks, elk decoy, spare release, second butane lighter, and my Katadyn H2O water filter. I plan to use iodine tablets and neutralizers for water purification. The streams run very clear where I go backpack hunting. And I know where they are. If you are new to an area, or I was less familiar, I would stick to my tried and true Katadyn filter despite it's fourteen ounce weight. I am also removing some of my spare batteries as I return to BaseCamp every four or five days, there is ample opportunity to recharge. The weight reduction of these items alone amounts to a little over 3 ½ pounds. I plan to replace a few items with newer/better/lighter equipment. I am switching to a Havalon Piranta razor knife with 5 spare blades rather than carry two knives and an ultralight sharpener. For those familiar with the Piranta, I did elect to purchase some #22XT blades. I believe this blade will be much safer than the stock #60XT blade sold with the knives. (That blade is for doing autopsies, and I would rather not do one on myself). I am also planning to carry a sleeping bag that weighs 8 ounces less than 2012. Since I am carrying rain gear regardless of weather, I can wear that if temperatures drop to the low end of the spectrum. I typically sleep in my underwear and shirt. I will bring my 2012 bag to BaseCamp as a back up, in case the weather is much cooler this year. (I hope so). Worst case scenario is that I might be chilly for a few nights until I get back to BaseCamp, but I am fairly certain that I will be fine. I will add comments to explain my train of thought on the things I take with me. 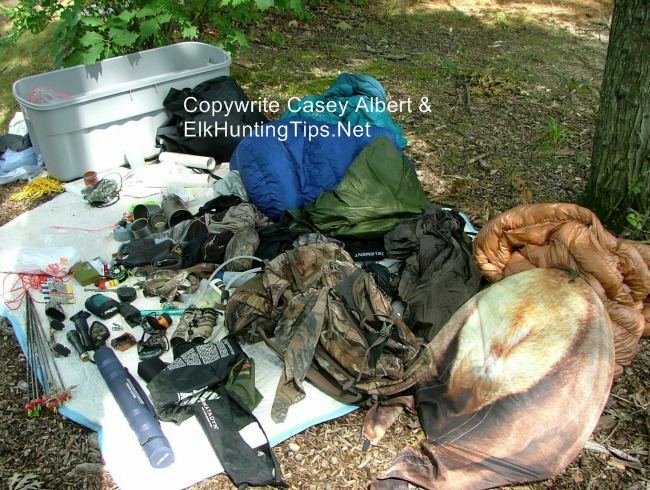 There will be pictures added so you can see just how the stuff that starts out looking like a big “pile of crap” actually gets into one little hunting backpack. I will separate base camp gear from my backpack hunting gear list. If you have a better idea, tell me below! I will consider adding it to my list. It's one thing to carry a fairly heavy load of backpack hunting gear down a trail four to six miles, set up camp and day hunt from there. It is quite another to "hunt with camp on your back." 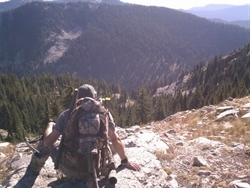 Weight and balance of the load become very important on a BackCountry backpack hunting trip. The list below will help. The Hennesssy Hammock is a self contained unit which includes an attached bug net. The underquilt is a must-have additional piece of equipment anytime you get below about 70 degrees. You would get cold even in September if you attempted to sleep on a hammock without it. A less expensive hammock is made by Trek Light Gear. It is about 14 ounces lighter than the Hennessy. My Hennessey hammock has replaced the Luxury Lite Cot on my back. I'll never sleep on the ground again, now that I have discovered hammock camping!it is an integral piece of my backpack hunting gear. 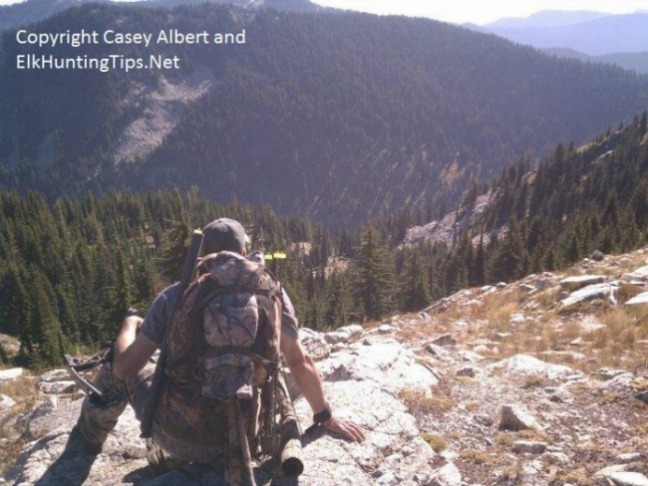 Following are items that I take with me on my hunting trip for BaseCamp, not items that I take with me while backpack hunting into the BackCountry. 2011 was my first attempt at hammock camping. I took along a bunch of gear for Base Camp. However, since I liked the Hennessey hammock so much, I no longer take the same gear. If you are setting up a Base Camp tent, I recommend that you bring additional Base Camp gear, if you can. That way you don't have to repack your whole hunting pack when you leave BaseCamp for your backpack hunting trips. Auto DC battery chargers and spare batteries: I have rechargeable batteries for my headlamp(AA), Spot Connect(AA Energizer Ultimate 8x), camera, and one spare range finder battery. The Black Diamond 4 battery headlamp I have been using comes in at a hefty 9.6 ounces, but I like the light it puts out and the 4 AA batteries have staying power. When that Lithium battery powered flashlight light dies it gets dark instantly. You can always wait till morning, but if you are butchering an elk at sundown you have no choice but to complete the job at hand. The nice part about it is that when you are backpack hunting you have your camp with you. Sea to Summit pocket shower: Fill it up when you set up Base Camp. Hang it where it gets sun. You will have some warm water waiting for you! Beats bird-bathing in a chilly mountain stream any day. Dwight Schuh pack frame: This is my choice as a pack frame. I use good quality straps and the bare frame for packing meat. I've had this frame for at least ten years, maybe longer. I will take this frame again as I haven't found a good replacement. I did learn that my Badlands 2800 pack, which I love, just isn't big enough to haul elk quarters. I purchased the Badlands Sacrifice pack recently, however I will also bring the 2800 as it is BackCountry proven. Wash basin: A cardboard box with a plastic trash bag lining would work. It doesn't have to be fancy. Utensils: (spatula/frying pan) Whatever you decide to make your hunt fun and enjoyable at base camp. Extra Jet Boil fuel canisters: The Jet Boil is an amazing little rig! I did run out of fuel late in my trip last year. 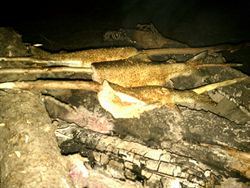 I started a little campfire to cook that last trout. This year I plan to use a new canister after 4 days of two meals per day use. I only use my stove to heat water. I don't cook any meals over my stove. I still have some pre-hunt experimenting to do. Hyperwing Tarp: This is fairly large, weighs about two pounds, and can provide a roof to hang out under during a rain. This one has been relegated to Base Camp. If you are driving to elk country, by all means take a large tent if you like. As I mentioned, I have attempted to reduce, and reduce again as much as possible because I fly to my hunting area. I sometimes plan a backpack hunting rifle (second) trip for the fall. Since the weather is more unpredictable later in the year, I have to start making a new list taking all of that into account. 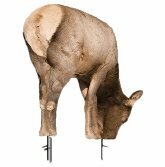 A friend of mine will bring a wall tent for that cooler rifle hunting trip. Marmot "Helium" sleeping bag: This particular bag is waterproof. This is a 15 degree bag that has proven to be perfect in any conditions that I have experienced in my hunting range. If you sleep with your head in your bag, the bag will become damp from the water in your breath. Take time to turn it inside out to dry every now and then. This is my “all inclusive” clothing list. I take some extra clothes just in case I get soaked, can't wash my clothes, or the weather is extreme. In a typical year, it's anywhere from some wet snow days, rain soaked days to temperatures reaching into the 80's during the heat of the day. Be prepared for where you are going. In addition to my hunting clothes, I have my travel clothes. All of my hunting clothes are pre-washed in scent free detergent, packed in plastic bags with some evergreen scent squirted in. I might smell like a freshly cut tree, but the elk haven't seemed to mind. Last year, as many of you might recall, was an extremely smokey year in parts of elk country. I hung all my clothes out to absorb some good smoke scent. It worked! Your feet are the single most important piece of equipment you will hunt with if you are doing Backcountry, and are going to have a good time. I am wearing Meindl 9” Gore-Tex boots. I used to wear low hiking boots, but found that 9” boots provide much better ankle support, not to mention when you step in a mud puddle that is deeper than you think. The extra few ounces of boot are worth it. Remember that waterproof boots don’t stay waterproof indefinitely. 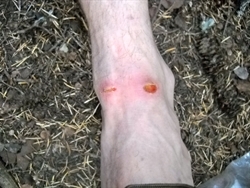 The Gore-Tex liners wear out long before the boots do. Don’t neglect to buy new ones regularly, since they are vital to an enjoyable hunt. Also, don't neglect to break them in! 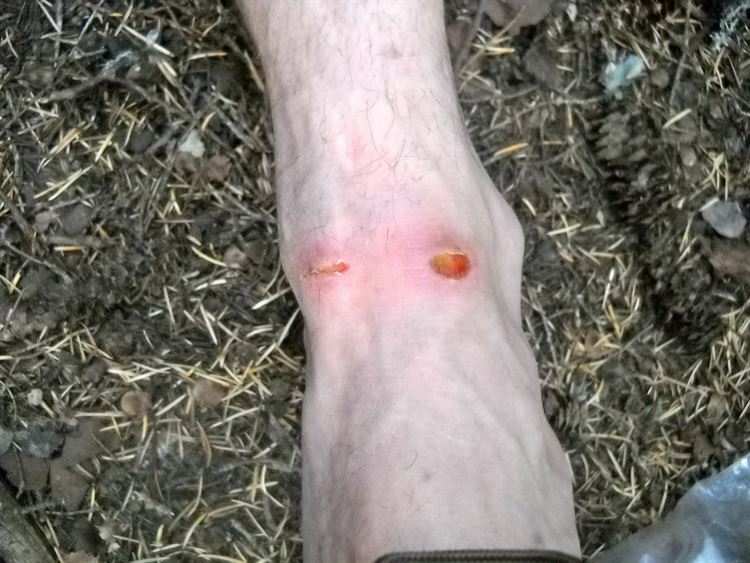 Contrary to popular belief, you don't have to get blisters! I have high arches. Last year these boots rubbed the top of my ankle raw and I was planning to look for an alternative. I finally used small strips of medical tape to protect my feet. This spring as I was debating new boots, I decided to lace my boots differently and try them out. The change in lacing has worked, and I will use these same boots again. I will take some tape, and use it at the first indication of pain or wear on my foot. Pants: 4 pair. 2 for hunting, 1 rain pants, 1 pair for base camp. This is Cabela's ultralight waterproof jacket. I find that with my turtleneck shirt, vest or outer garment and this lightweight shell I am comfortable for just about any weather I experience during my backpack hunting trips in September. In my weight reduction madness, I am going to try the suspenders that came with my new pants this year. A belt can interfere with the backpack belt. I carry a regular cap and a Gore-Tex cap. I find the Gore-Tex too warm unless it is raining. I wear a hat almost all the time. It seems every time I take it off, the sun shuts down the eyes and I can't see as well in the woods. I picked up a beanie cap to wear primarily at night. This can be worn at other times, if necessary. My favorite are ultralight ones. I wear them primarily as camo. I think animals see our skin (especially when unshaven) as a different sheen than the surroundings and it makes them curious enough to pay us extra attention. I just bought some of the black microfleece gloves that I have been using for years. Because they have very good evaporative qualities, they make your hands colder when wet. When it starts to rain, I typically take them off before they get soaked. 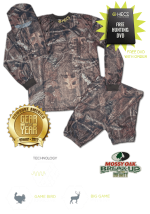 These gloves are great for bowhunting, great for rifle hunting, and much cheaper than most gloves sold in “camo” colors. My mask is kept in one of my pants pockets and only goes on when I am on a bull. I’ve seen many videos of guys hunting with no mask, no gloves, etc. It seems like every time I try that, I get busted! I wear one of these at all times during my hunts. It covers my neck. This one is warmer, and I use it more often at Base Camp than during my backpack hunting outings. Some of the lightweight "windproof" clothing is very effective at keeping you warm. It's all about layering lightweight clothing. I bought one weighing in at 11 ounces,but until I can find a lighter one I will probably do without.I will carry a plastic trash bag for use as waterproofing for my pack. I recently purchased the 2013 Badlands Sacrifice Pack. It is slightly larger(3450 cubic inches) and weighs in at 3 pounds 9 ounces. This is nearly 1 ½ pounds lighter than the Badlands 2800, and more water resistant. I will spray this down with some scent free waterproofing after I get a chance to hose it down. My pack will get a dose of “evergreen” scent also. H2O Sea to Summit compression sack (4.9oz). Should I have to carry my heavier bag, it takes up as much space as the two listed above, so I will have to pack the bag and underquilt separately in compression sacks. Ultralight Hammock in Snake Skins (20oz) For those interested in the prospects of “hammocking,” I have written a short article concerning this. I am by no means an expert in the art of “hammocking,” however I have combined what I believe to be some of the best and lightest pieces of equipment to make a system that is extremely easy to pitch, very easy to adjust, and can get you and your gear out of the rain quickly if necessary. Binoculars with Cabelas chest strap – I accidentally left my binos behind one day last year, and constantly found myself grabbing for them. Bugle tube – I retired my 20 year old bugle tube for a “new” compact model. When I got back to BaseCamp, I retired my “new” compact model. The elk probably didn't care those first several days, but I didn't hear any bulls! Check all your equipment for shiny stuff that is showing and paint it a flat color. I haven't verified my weights just yet, but I believe I have dropped at least 5 pounds from my pack weight of last year. If that is so, I could easily plan to spend more nights in the field, though I will probably stick to five as my maximum. I highly recommend that if you are planning to hunt with your camp on your back, or simply carrying a well thought out daypack, get yourself an inexpensive digital scale and weigh each and every item you put into your pack. Then, pull them all out and make quite certain that you truly need each and every one of those items. A little prior planning goes a long, lighter more enjoyable way. I would like to reiterate that what I carry for backpack hunting may not work for everybody, and especially for where you are hunting. This year, I am constantly reminding myself that last year was very mild (warm, dry), so that I don't lull myself into a sense of stupidity. Trust me, I have made all of the mistakes humanly possible over the years. I have been soaked to the bone, tried to destroy my feet with ill-fitting boots, attempted to sleep in soaking wet down sleeping bags, been bone chattering cold, and been mildly dehydrated to name a few. Prepare carefully for backpack hunting trips. Be safe and comfortable. Pay attention to every detail, including where you put everything. Keep a list of what you take and where you put it. Adjust that list when you get a better idea. Hopefully, my list will get you started and help you begin to organize your gear in advance of your backpack hunting treks. You will be able to camp wherever you are when the sun goes down and resume hunting right from your sleeping bag in the morning. That is the magic of backpack hunting! 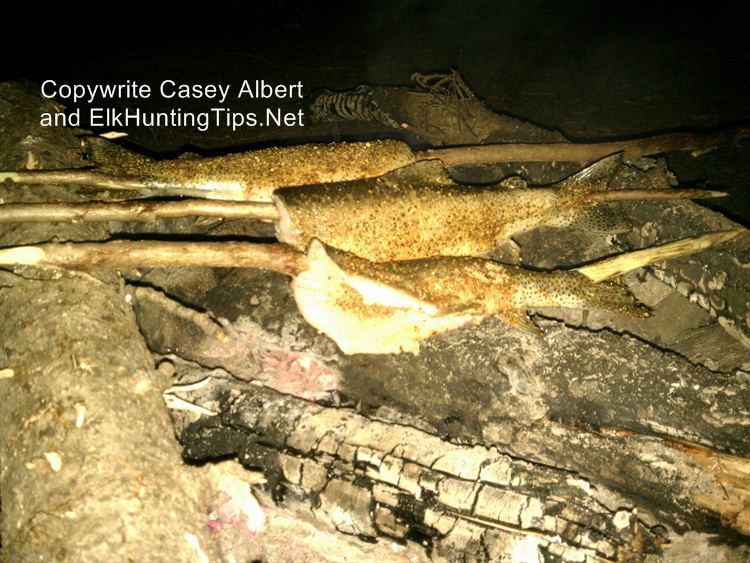 See the BackCountry Hunting page here and the Backpack Food Ideas page here.